DEERFIELD BEACH, Fla. – Iron Mike Productions (IMP) returns June 6 to the site of its promotional debut last August, Turning Stone Resort Casino in Verona, New York, to present another live ESPN Friday Night Fights event from upstate New York, celebrating the 2014 International Boxing Hall of Fame induction weekend. Ascending 2004 Olympic silver medalist Yudel Jhonson (15-1, 9 KOs) headlines in the 10-round main event against Mexican invader Norberto “Demonio” Gonzalez (20-3, 13 KOs) for the vacant World Boxing Council (WBC) FECARBOX Junior Middleweight Championship. 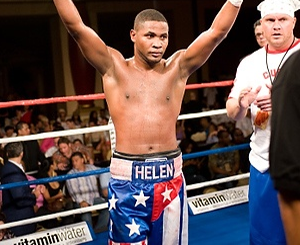 Jhonson, the two-time Cuban National Champion now fighting out of Miami, was a gold medalist at the prestigious 2002 World Cup, defeating former world champion Daniel Geale, in addition to winning top honors at the 1999 Pan-American Games, 2001 Goodwill Games and 2006 Central American & Caribbean Games. Gonzalez, a former Mexican welterweight champion, is coming off of a controversial 10-round split decision loss to Roberto Garcia (33-3) this past February, after winning an impressive 10-round unanimous decision over Michael Oliveira (21-1) last November. In the 8-round ESPN co-feature, two-time All-Army and Armed Forces champion Sammy “The Who Can Mexican” Vasquez Jr. (14-0, 10 KOs) takes on fan favorite “Smokin'” Jay Krupp (17-6, 8 KOs) from nearby Catskill, New York. The highly-entertaining Vasquez is an undefeated welterweight from Monessen, Pennsylvania who did two tours in Iraq as a U.S. Army National Guard specialist. He reached the semifinals of the 2012 U.S. Olympic Team trials. Krupp’s last fight was an 8-round loss by decision to 2008 Olympian and present North American Boxing Organization (NABO) welterweight champion Sadam Ali (19-0) last September, in which Krupp dropped Ali in the opening round. Unbeaten 2012 Ukraine Olympian Ievgen “The Ukraine Lion” Khytrov (4-0, 4 KOs) will make his first IMP appearance in a six-round Special Middleweight Attraction versus battle-tested Chris Chatman (12-3-1, 5 KOs), of San Diego, in the ESPN opener. The 25-year-old Khytrov, now living in Brooklyn, was a gold medalist at the 2011 World Championships as well as the 2007 European Junior Championships. Chatman gave current WBO junior middleweight champion Demetrius Andrade (7-0) his toughest fight to date as a professional (DEC6 in 2009) and fought Charles Hatley (14-0) to an 8-round draw in 2011. Detroit light heavyweight Isiah Thomas (12-0, 6 KOs) puts his undefeated record on the line against Pittsburgh veteran Rayco “War” Saunders (23-23-2, 10 KOs) in an 8-round fight. Thomas’ last action was a 10-round unanimous decision win over former World Boxing Association (WBA) light heavyweight champion Richard Hall (30-10) for the interim WBA Fedelatin cruiserweight title. Popular light welterweight Johnny Garcia (19-1, 11 KOs) will also make his IMP debut in an 8-round fight against John Williams (11-3-1, 5 KOs), of Charlotte, North Carolina, for the vacant World Boxing Council (WBC) Latino title. Garcia, the pride of Holland, Michigan, is riding a six-fight win streak, while Williams has won four of his last five fights. Fighting on the undercard in 6-round bouts are Florida junior lightweight prospect Dennis Galarza (3-0, 2 KOs) vs. Gadiel Andaluz (4-6, 2 KOs), of Chicago, and Pennsylvania junior welterweight Sam Quinones Jr. (6-2, 2 KOs) vs. Cleveland’s Brett Simmons (2-0-2, 1 KO). Also scheduled to be in action in separate 4-round fights against opponents to be determined are 50-Cent promoted lightweight Ryan “Blue Chip” Martin (5-0, 3 KOs), of Cleveland, and Detroit light heavyweight Leo Hall (1-0, 1 KO). Doors open at the Turning Stone Resort Casino Event Center at 7:00 p.m. ET on Friday, June 6. The first undercard bout starts at 8:00 p.m. ET with the live ESPN2 telecast beginning at 10:30 p.m. ET.